As soon as she walked into the room, Kayla Blincow knew this was the space she had in mind for their new business: big windows and tall ceilings. 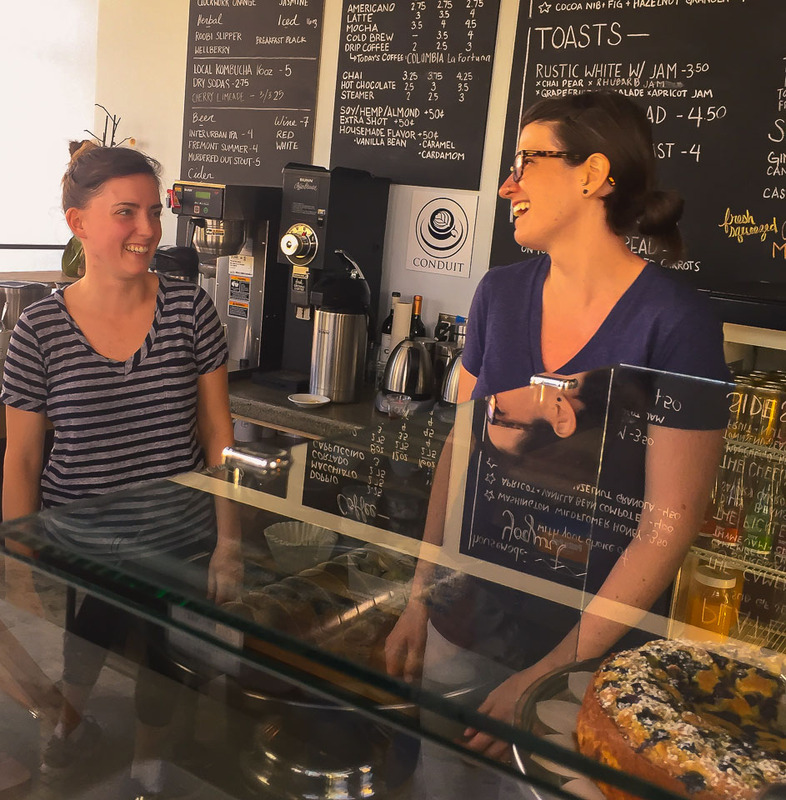 “As soon as we saw the light, we were sold,’’ said Blincow, who teamed up with friend Tess Smedley about a year ago to open Preserve & Gather, an airy coffee shop with delicious snacks at the corner of Northwest 85th Street and Sixth Avenue, between Greenwood and Crown Hill. “We wanted to be part of a neighborhood that was growing, and thriving,’’ added Smedley. Their shop occupies the front space of a recently completed four-story building with 32 units, each about 200 square feet, at 358 NW 85th St. A touch of blue and gold hand-stenciled on the back wall offsets the clean, industrial, look. The coffee machines and a pastry case sit on a long bar of poured concrete. Seating is provided at three small tables, two large ones and eight stools at a counter below one of the large front windows. Preserve & Gather, and the building it occupies, is located three blocks east of Crown Hill Urban Village proposed expansion area along 85th St., a busy arterial that is zoned commercial and multifamily low-rise. The Crown Hill Urban Village Committee for Smart Growth has been recommending to city officials that growth be encouraged through development incentives along busy arterials such as 85th Street and 15th Avenue, leaving residential neighborhoods intact. The Preserve & Gather building is one example of the kind of development the Committee for Smart Growth supports – a mixed-use building along an arterial with businesses on the ground floor. A similar, larger, development is already going up within the Crown Hill Urban Village on Holman Road across the street from the Crown Hill Skate Park that includes 105 housing spaces over 3,800 sq. ft. of retail and nine live-work units at ground level. Despite sixteen new developments currently in progress along CHUV arterials, few include retail space; which would improve livability as density increases. The Crown Hill Urban Village Committee for Smart Growth is advocating for new development that includes both small commercial businesses like Preserve and Gather and office space for small businesses like the law offices that recently were displaced. The group particularly is interested in pedestrian friendly businesses that become part of a more walkable urban center. Amy Englesberg, a piano teacher who lives a few blocks away from Preserve and Gather in Greenwood, started coming a few months ago. Owners Blincow and Smedley, both 30, didn’t set out to work in the food industry. Smedley graduated with a degree in environmental science from Virginia Tech. Blincow was a sculpture major at the University of Puget Sound. They met working at the Fat Hen in Phinney Ridge and began talking, and dreaming. “We cooked at home and we bonded over that,” Smedley said. They also found that they shared something else: “We are daughters of men without sons,’’ she proudly added. They soon found out they liked canning, and they began to do that together. They also liked to make things like marmalades, jams, and pickles, among many other small dishes that can be found on the menu. As anyone who has worked in the service industry will attest, it was not easy in the beginning. They got a lot of people to pitch in. They raised $22,000 in a Kickstarter campaign, paying back supporters with their names painted on the floor below the bar. Their coffee conduit let them film the campaign’s video at the roaster. They got Blincow’s husband, a carpenter to put up walls. The two women poured the bar’s concrete top. They stenciled the blue-and-gold walls by hand. They built the benches and tables. One of their dads is an engineer builder and came out to help. Blincow, the sculpture major, did all the design work and the permitting with the city. They only hired out the plumbing and electrical. “That’s the only way we could make it,” said Bincow. Si Ith, the developer, said he’s happy his building is attracting attention. “It’s a great space for young people, and some older ones, to live in a neighborhood where they can walk to almost everything,’’ said Ith, an architect educated in France before he relocated to Seattle more than three decades ago. The shop is open six days a week; opening at 7:30 a.m. and closing at 4 p.m.
After nearly eight months of 80-hour weeks, things are slowing down, giving them time to catch their breath. They’ve begun to hire new staff. They’re waiting for the city to approve the outside patio. They want to open until 8 p.m.
“All that will come in time,’’ said Smedley.